When I checked into my flight, I realized that I purchased a "Basic Economy" ticket. This means that I got to take one personal item on the flight or pay $25 or $30 each way for a bag, even if it's a carry-on bag. Yes, I managed to fit everything I needed for the weekend and the flights into a backpack. I'm going out of order, but besides the hockey game, the one thing that I had to do in Dallas was see The Sixth Floor Museum at Dealey Plaza. The trees are much taller now, but this picture is from the sixth floor of the building formerly know as the Texas School Book Depository, just several feet away from where Lee Harvey Oswald shot President John F. Kennedy. Despite the assassination occurring 55 years ago, this museum seems to be the top tourist attraction in Dallas. I'm sure that city and corporate officials want the focus to be on arts, sports, and other things, but I get a sense that the assassination is always going to be a significant part of Dallas. (As an anecdote, I asked the waitress and hostess at a restaurant what's one thing we had to see in Dallas, and they both replied, separately, the JFK Museum.) Anyway, I highly recommend visiting the museum. Oh, I didn't expect to see the Pittsburgh Post-Gazette available at the gift shop. I also didn't expect to see this T-shirt available a few blocks away from the museum. I noticed the don't take pictures sign about a minute after taking this picture. The reason for going to Dallas during a cold January weekend was to see the Dallas Stars, making it the 24th game/arena my friend and I have seen together over the past decade. 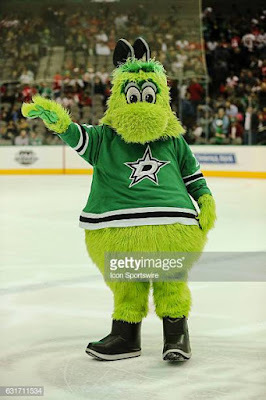 I really like the Dallas Stars green and even the giant star that comes down onto the ice during the pregame ceremonies. It's not as good as the sabretooth Nashville Predator, but it's a close second (until I see the San Jose Shark in person). I couldn't get a great picture, but it's nice to see someone appreciate Dallas Stars legend Jaromir Jagr. One neat feature of the American Airlines Arena is that there is no room for the visiting back-up goalie on the bench. Therefore, he needs to sit way over here. There's no reason why the North Stars moved to Dallas and why they keep the retired numbers of the Minnesota players. You'll notice that this was not my picture. I really, really, really, really wanted to take a picture of and with the Stars' mascot Victor E. Green (better known as Texas Youppi! ), but it didn't happen. Maybe if I got a picture with Victor, the Stars would have won. Instead, the St. Louis Blues won 3-1 with Vladimir Tarasenko scoring two goals. In the two Blues games we've attended, Tarasenko scored 5 goals. Coincidence? We also saw the Allen Americans face off against the Wichita Thunder in an ECHL minor league hockey game. If you're holding a baby in a front row seat and feel the need to bang on the glass, you got to do what you got to do. Even though the team is called the Americans, this seems like some Communist propaganda celebration after goals. By the way, I hope that Zachary Pochiro makes it to the NHL, so I can say that I saw him score 4 goals in a game for the Americans! I also feel like the Americans should have pictures of Keri Russell and Matthew Rhys throughout the arena. Deep Ellum appears to be the cool, trendy area. We drove through on Sunday morning, and I felt the need to take a picture of this odd robot statue dude who likes to hold pigeons. Finally, I arrived back to Dulles Airport to this. Actually, Dulles was closed, so we got diverted to Philadelphia and sat on the plane, refueled, and were able to fly back when Dulles reopened. I got home about 3.5 hours later than expected, but at least I made it home on the same day. And this was Monday morning back in Virginia. Time to shovel. The Bush Museum is definitely worth the price of admission! And the JFK Museum too. Glad you got to venture into Dallas! Thanks Nichole and thanks for the suggestions on places to go!